Fearless, as used here, is a reference to a book by the same title that was written by Max Lucado (Nashville, TN: Thomas Nelson, Inc., 2009). I was so impressed with the book that I developed a series of discipleship development teachings based on the book. 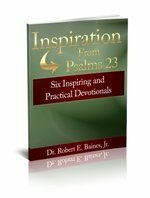 You would be blessed to purchase and prayerfully study it for yourself (click here to purchase); however, I believe the following notes will be a great blessing to you as well. There are too many believers who are too afraid of the things of this world; consequently, their lives are being lived at such a lower level than they have to be. I am praying that instead of being afraid that we will life by faith in God.